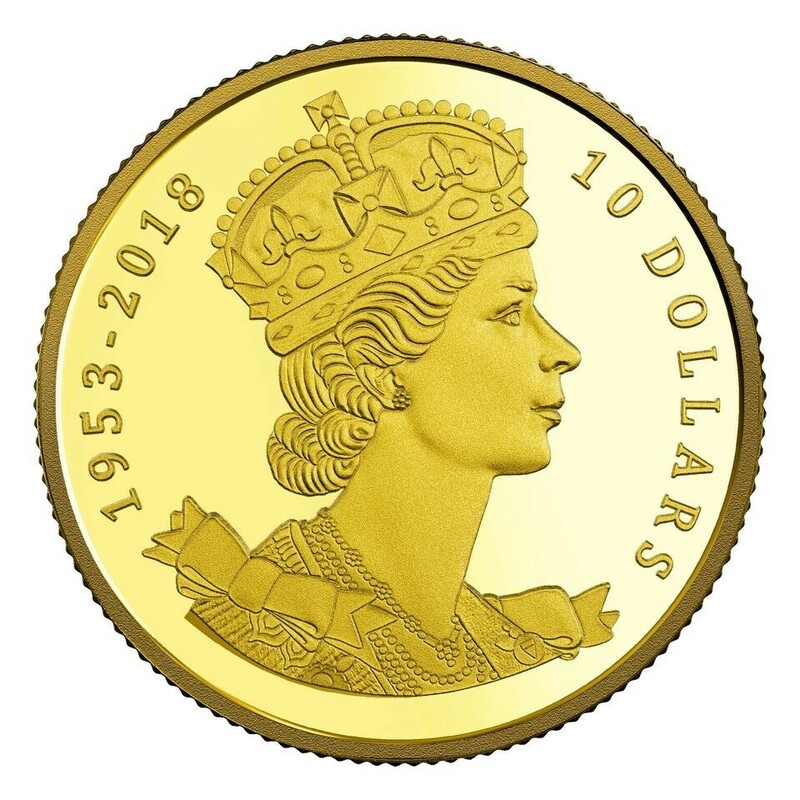 The Royal Canadian Mint has released new fine gold coins in remembrance of the 65th anniversary of the coronation of HM Queen Elizabeth II, which occurred on the 2nd June 1953, in Westminster Abbey, London. Queen Elizabeth II, then the Duchess of Edinburgh and heiress presumptive to the British throne as well as the Dominion of Canada, acceded to these thrones on the 6th February 1952. While the royal couple were taking some needed rest in Kenya en-route to Australia, the sad news was delivered to the Princess’ secretary that her father had died in his sleep. Relaying the news to Princess Elizabeth was left up to the Duke of Edinburgh, who not only had to tell his wife of the loss of her father but also that from that moment on, she was now Queen of Great Britain and the many other realms within the Commonwealth. The royal couple immediately flew back to the United Kingdom where the former princess would set foot back on British soil for the first time as Queen. She was met by her new Prime Minister, Sir Winston Churchill, who bowed to his new sovereign, and at just 25 years of age, the life-long commitment to the nation and Commonwealth as Queen would begin. The new Queen Elizabeth II was also a young wife and new mother at the time of her accession, and it was announced several weeks after the state funeral of King George VI that a coronation committee was formed, headed by her husband the Duke of Edinburgh. The ceremony, which confirms her position as anointed sovereign, head of state, lord of the realm, and head of the Church of England, was to be held 16 months after her initial proclamation as Queen. The date was announced as the 2nd June 1953, and, as it turned out, the day was rainy and a bit overcast. Despite the weather, the glittering ceremony was attended by heads of state, government, royalty, nobility, and representatives from just about every country, assembled in Westminster Abbey, the traditional place of all English and British coronations since the time of William the Conqueror. As the crown of St. Edward was placed on her head by the Archbishop of Canterbury, the nation also pledged their loyalty to her. The Coronation also had the distinction as the first to ever be televised, despite many government officials who opposed the idea. Prince Philip, however, insisted it be televised and the viewing audience was estimated to have been numbered at more than 27 million in the United Kingdom alone, and as many as half a billion worldwide. Canada’s new Queen first visited the country briefly and informally during a brief stop-over for refueling in Newfoundland in 1953. She was awakened in the early morning hours by a gathered crowd outside her window, where she acknowledged their affection and sentiments. Her first official visit to Canada was in 1957 where she addressed the nation live on television and appointed her husband to her Canadian Privy Council at a meeting which she chaired. On the 14th of October, Canada’s Queen formally opened the first session of the 23rd parliament. In total, Queen Elizabeth II has paid 22 official visits to Canada, more than any previous monarch, with her last visit occurring in 2010. 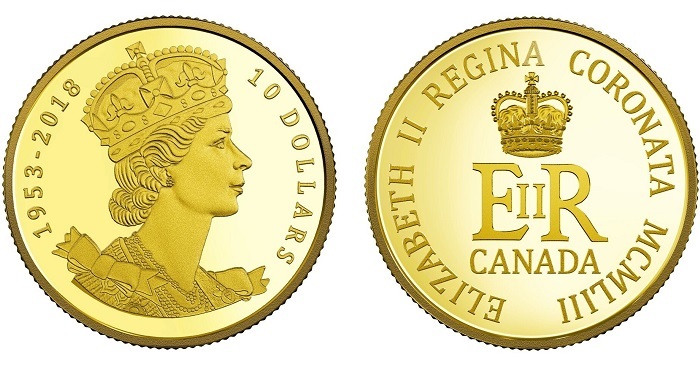 The obverse side of the coin is designed by Royal Canadian Mint engravers who have modeled this regal portrait of Her Majesty Queen Elizabeth II after her effigy on the 1953 bronze coronation medallion. The Queen is shown facing right and wearing St. Edward’s crown, with fine detailing highlighting features of the coronation gown and the Queen’s pearl necklaces. The portrait is framed by the anniversary years 1953-2018 and face value of 10 DOLLARS that are engraved along the coin’s outer edge. It is noteworthy to mention that more than three million bronze coronation medallions were distributed to schoolchildren in 1953. The Queen’s portrait that appeared on the medallion was one of 27 proposals that had been submitted by individual designers and firms in Britain. 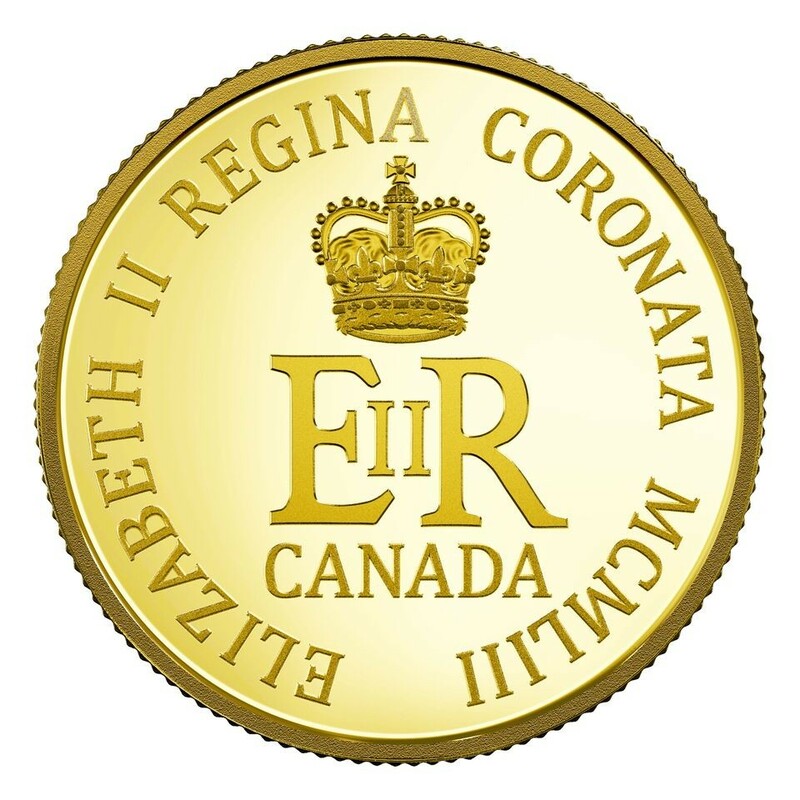 The reverse side features the Queen’s cypher E II R, which is surrounded by the inscription ELIZABETH II REGINA CORONATA MCMLIII. 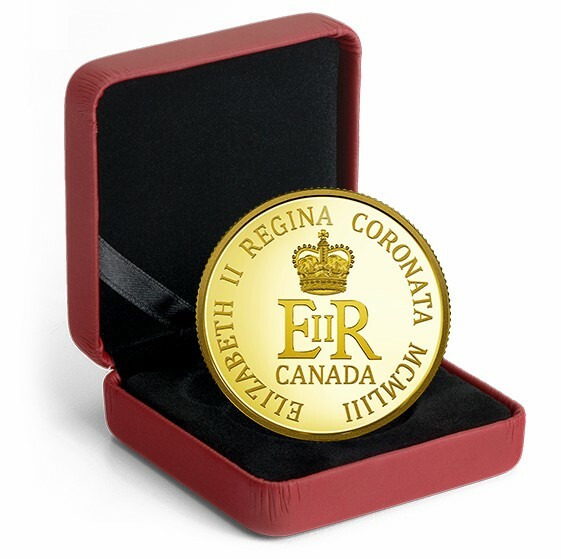 The coin is encapsulated and presented in a custom branded case which also includes a certificate of authenticity. For additional information about this coin and others available from the Royal Canadian Mint, please visit their website.